Hiking is one of many hidden pleasures for people living in and around Niagara, and more and more, it’s becoming a popular tourist activity as well, which makes sense. The same geographical qualities that make the area unique — the escarpment that makes the waterfalls possible, the amazing terroir responsible for the world-class wines, the Niagara River, the Niagara Gorge, and even Lake Erie — also make it a wonderful place to get out in nature and explore. While you can gaze across Niagara Falls and never fail to appreciate the natural world, another way to add to your appreciation of the area is by getting out and going on a hike. Whether you routinely head into the wilderness, or you’re just now getting your hiking boots wet, here are four routes to suit the range of hiking abilities for those who vacation to Niagara. The Bruce Trail is Canada’s oldest and longest foot trail. It follows along the Niagara Escarpment, starting in Niagara-on-the-Lake at Queenston Heights Forest. It’s a wealth of wonders, from the animals and birds you can spy along it to the remarkable flora — some rare — that flanks the trail and changes over the miles. If you’re looking for a way to experience Niagara that’s a bit unusual and will also get your blood pumping, tackle part, or all, of the Bruce Trail. A paved trail that’s eight feet wide, this popular recreational trail makes biking, running, walking, hiking, rollerblading, or getting around in a wheelchair a breeze. The Niagara River Recreation Trail is open all year-round and can accommodate hikers of all skill levels, and it wanders through 35 miles of absolutely beautiful countryside. Running parallel to the Niagara River, it stretches from Historic Fort Erie all the way up to Historic Fort George. Niagara Glen Nature Reserve is one of the best remaining preserves of Carolinian forests in all of Ontario, and it features an excellent trail that wanders right through luscious, thick trees. The two and a half miles of path undergo an elevation change of over 200 feet, and the terrain can become quite rugged and steep at times, so don good footwear. 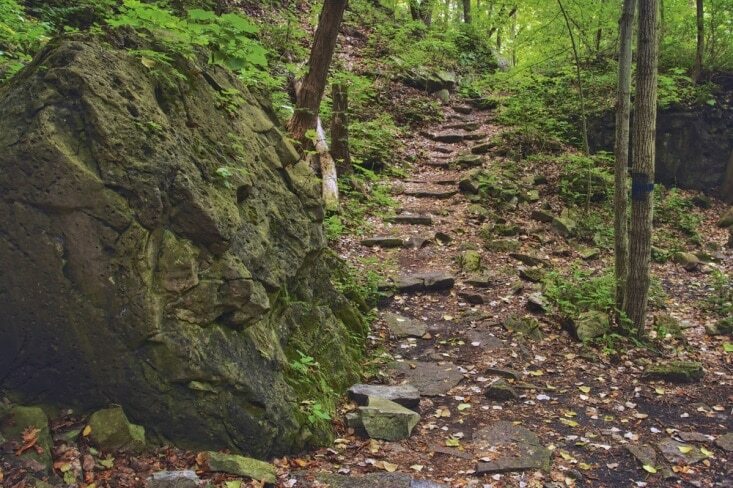 You’ll see massive boulders, fascinating wildlife, and stunning flora as the Niagara Glen is one of the most pristine preserved spaces in all of the Niagara Escarpment. 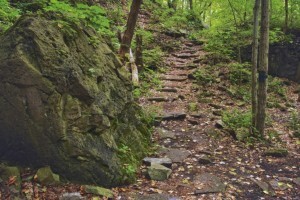 A side trail that cuts off from the Bruce Trail, the Adam Dopko Access Trail allows for a unique experience of the Niagara Escarpment’s geology. Somewhat challenging and delightfully rugged, this trail goes through part of the Woolverton Conservation Area, a passive nature area of 46 acres. Besides seeing an abundant number of Sugar Maples, birds, and other animals while you’re walking, you’ll also see some of Ontario’s best examples of mantled plains, terraces, and escarpment slope. 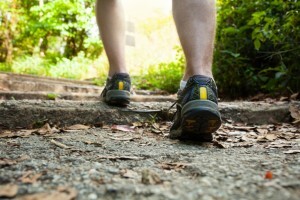 Be sure to take a Bruce Trail map with you to find your way, and wear good hiking shoes or boots. Hiking Niagara isn’t just a great way to get outdoors and get some exercise while on vacation, it also provides a window into the region’s rich and unusual geographical history and thriving natural spaces.